I have been going to this Ophthalmologist for several years. I have recommended several friends to see him. My husband seeshim too. We really like him. He is straight forward, and very professional. I had something stuck under my eye lid for a week and that is when I discovered this doctor. I have been going to him ever since. I trust him completely in the care of my eyes. I have been going to this Ophthalmologist for several years. I have recommended several friends to see him. My husband sees him too. We really like him. He is straight forward,and very professional. I had something stuck under my eye lid for a week and that is when I discovered this doctor. I have been going to him ever since. I trust him completely in the care of my eyes. Long waiting time but great doctor with friendly manner and extensive knowledge in eye care and illness. Dr. Ahdoot is a staunch advocate of a personalized approach to patient care. He creates a warm and caring atmosphere in his office for all patients. He places great emphasis on educating his patients and involving them in their own eye care. 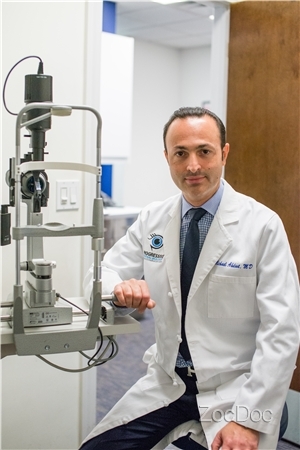 Supported by a state-of-the-art office, Dr. Michael Ahdoot and the Staff of Progressive Ophthalmology provide comprehensive, quality service and superior results. I’m glad I was able to book my appointment in a timely manner. Dr. Ahdoot was a professional. Even though Dr. Ahdoot had an office with other patients, I was pleasantly surprised at how quickly I was seen, with hardly any waiting time. The staff was excellent and Dr. Ahdoot performed several extensive tests and answered any questionsI had. He is going to be my eye doctor for all future visits. Dr. Ahdoot is the best! I am happy with my visit. Very nice, professional staff. The wait time was a little longer than I would expected but it was my first visit so I needed to fill up all the paperwork, wait for the reception tocontact my insurance etc, so I guess next time will be faster. Highly satisfied! Front and back staff are friendly, courteous and attentive. Dr. Adhoot is a one of a kind; shows concern, takes his time, performs a very thorough exam and answers questions. Dr. Ahdoot is wonderful! Professional, easy to talk to, and explained everything in a way that it was super easy to understand. The Technicians are wonderful as well. In contrast the front office staff is a terrible. Super long wait almostan hour past my time slot and rude in particular the office manger is rude and unprofessional. The doctor is great if you have all day to wait. I really enjoy my visits to his office. I like the atmosphere and all the staff including the doctor are warm and professional. Very professional and warm, gave a man excellent breakdown of what the problem was and how we can fix it. He is very professional and attend to your questions. I loved the environment. I was provided with a good service from the start to an end. Dr. Ahdoot’s office performed an extremely comprehensive eye exam. He was able to provide his assessment in a cohesive manner. I would recommend his practice. Both the staff and the Doctor were warm and friendly and efficient. It was great and time went by rapidly! I would definitely recommend this doctor! Waiting room was packed and I waited about 40 minutes but overall great experience. Clean, professional, friendly, thorough. Since I'm a regular patient, he has been very attentive to my query. The office is friendly, clear and concise. They saw me right away and were very helpful. This is not my first visit with Dr Ahdoot and I have no complaints or criticism. His staff are all exemplary in their duties. Very mannerly and polite. I haven't had a single bad experience. I want to say thanks to the office for always being kind to me. Wait time was a bit much as I had things to do before going to work. Very professional, full-staffed office with a lot of technology. Very nice person and very knowledgeable. The staff is extremely friendly & accomdating. And Dr Ahdoot is a very knowledgeable and compassionate physician. I highly recommend him. Very professional and helpful. I will definitely come back in 6 months. Thank you Dr. Ahdoot! Loved the office and Dr.Ahdoot! The receptionists were kind of loud, but the office is spacious and clean. Overall, satisfied. Very good visit. Technicians were thorough and brought me into different testing areas to have different exams done. Doctor saw me with the results of the tests in front of him. I highly recommend!